Scott Brown and Gail Huff: Sexist to Women or Just Dumb? What Should We Make of Scott Brown and Gail Huff’s Comments on Women? 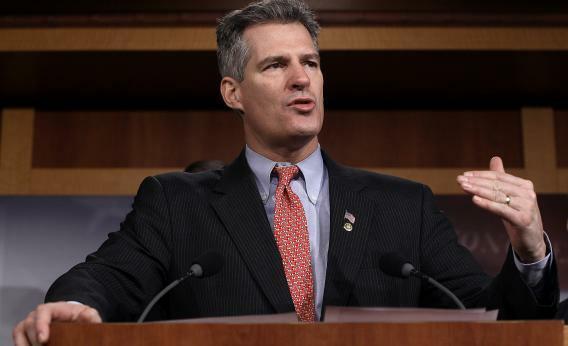 U.S. Sen. Scott Brown (R-MA) respects “strong-willed women” who teach him how to cook. It’s no surprise that here at DoubleX, we’re constantly on the lookout for sexism. And yesterday, Republican Senator Scott Brown—who’s vying with political superwoman Elizabeth Warren for the Massachusetts seat—said something sexist. In fact, the thing he said with a masterful assist from his wife, Gail Huff, was so sexist, so absurdly chauvinistic, that it was basically a caricature of sexism, a scenario right out of some poorly edited workplace training video from the 1990s. In a perverse way, the silliness of the comment almost makes you wish for something better, a really toothsome sexist statement that would inspire more than just a sad shake of the head. Instead, we’ve crossed over into the land of political stupidity, and that’s a development that should concern Massachusetts voters far more than the nature of Brown’s stance toward women. Brown said he’s used to being surrounded by “strong willed women” and Huff said the family, including Brown and the couple’s two daughters Ayla and Arianna, have open discussions around the kitchen table. “The girls, now that they are 23 and 21, have very, very specific ideas about what they do and don’t believe and they chime in with a lot of great ideas, and it’s wonderful for both of us to be able to bounce things off of them because their generation sees things very differently,” Huff said. “Yeah, how to cook, how to sew, how to clean,” Huff added. We can agree that it is sexist to imply that all the ideas in a woman’s head have to do with the domestic arts. But let’s allow for a moment that Brown and Huff were joking, because, surely, they don’t actually believe that their own daughters are so limited. Why in the world would you make that kind of joke? When much of the very event you’re speaking at has to do with spinning your questionable record on women with assistance from Olympia Snow in a more favorable direction (Brown has recently been touting his supposedly brave bipartisan support for reauthorization of the shouldn’t-be-controversial Violence Against Women Act), why would you undermine the whole point of the thing with this inane mess? The only answer I can see is a disturbing lack of political sophistication, and if I were running against an opponent as savvy and formidable as Warren, that’s something I would be projecting in spades. But who knows? Maybe the Brown daughters—who I expect are rather personally embarrassed by this gaffe—will be able to help mom and dad out with some very pointed “ideas” regarding their intelligence next time they all gather round the kitchen table.